There are some authors who can slip from one genre to another without the slightest hiccup, buoyed solely by the strength of their prose. These are the sort of writers you read just to enjoy the infrastructure of their phraseology and the construction of the story. Anthony Doerr is infinitely resourceful for the former; I think L.H. Thomson is a strong candidate for the latter. My introduction to Thomson was the sci-fi novel The Process Server (go here for that 5-star review). Typically, myself included, most people seem to find a genre and stick with it. Not Thomson, who likens himself a literary polymath on the scale of Isaac Asimov. I'd call him an arrogant cad if it weren't for the fact that he pulls it off (damn him, anyway). 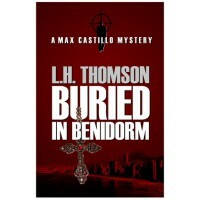 Buried in Benidorm differs in genre from The Process Server, but shares its strengths: rounded, complex characters with a history, tongue-in-cheek dialogue, short but effective descriptions, and here-and-there a poignant and amusing aside. Perhaps as interesting as the story itself is the history of the main character, Max, and how it informs the rest of the story, particularly his views on the church. Or, at least, the local magistrates. Max is a former priest who left to clergy but was unable to leave it behind. While he feels no allegiance toward the community of faith, it certainly feels he owes them a debt, along with substantial seminary fees. The story paints clergymen as men clinging to their clerginess, attempting to justify their typical-person behavior (haughtiness, avarice, etc.) by passing it through a sort of ecclesiastical car wash, as if being religious figures makes underhanded behavior acceptable and serving a higher purpose. The case, as we discover, involves the church trying to lay claim to a deceased aristocrat's wealth by implicating his wife in his death, thereby causing her to forfeit her inheritance to the church. That in itself is enough to raise eyebrows, but we also learn from Max that the bishop is, historically, a bully--he'd been one as a child and had no reservations about being one now. In fact, it is the mystery of Max' departure from the priesthood and loss of faith that is, at least initially, what drives the story, moreso than that of the murder discovered at the opening of the book. This mystery manifests not just as absence of faith and a focus on the secular, but very near animosity, which may be off-putting for readers of a more religious bent who take this perspective as an affront to their God rather than a judgment of the men whose responsibility it is to deliver His message. She detected my obvious discomfort. "And...? I take it something has interrupted?" I nodded briefly. "My former employer." I gave her a withering look. "Very funny. The diocese." She gritted her teeth like she had just driven over bumpy roadkill then uncapped a beer for each of us. "Ay. So, definitely not God, then." This isn't to say that the church is the only thing to take flak. There's plenty of scorn to go around as the characters in this story all seem to harbor one prejudice or another, whether it be Detective Nicodema's disdain for the wealthy (money creates crime), the layabout Domingo's disdain for the non-religious (though perhaps just Max), Tomas' disdain for Portuguese (which may be a regional thing), the disdain Caridad shares with Max for clergy (due to mistreatment), and pretty much everyone else's disdain for Max as a consequence of his departure from the church. That said, there is an abundance of backstory justifying each of these perspectives, so it never seems as though the author is simply projecting his hatred of one thing or another through his characters. Rather, it's more likely that a disenfranchised former Catholic priest who has turned to private investigation is predisposed to contact with people who have criminal pasts, and harbor grudges against those who have wronged them. Or, perhaps, that's just the way we all are, but fool ourselves into believing we're above the fray or have never had cause to dislike anyone. This was a good story and a good mystery by my reckoning (considering the limit of my Hardboiled Mystery reading consists entirely of The Happy Hollisters series, Josephine Tey's The Daughter of Time, and The Da Vinci Code), though it seemed what should have been the undercurrent dominated the work. Again, the main crime seemed to me more a chapter out of a larger work. And there's nothing wrong with that, so long as Max Castillo's story is not a one-off and is part of a longer series--which it is.